I have had this idea of reviewing books that I’ve read with a very short review – only the gist of them, the main theme so to speak – and it shouldn’t be more than five sentences. So, here goes the first one. 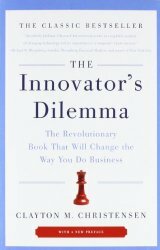 My Rating: 8.5/10The Innovator’s Dilemma – this book argues that the processes and resource allocation priorities that are setup in big corporations are not startup (new idea) friendly. For this very reason, it argues that big corporations often miss the boat on the new emerging and disruptive technologies. Because they are setup to keep churning more and more revenues from existing products and services. Their focus is to improve existing line of products and services, and ignore the new emerging technologies that are initially not directly competing with them. Eg; Telcos – SMS vs Whatsapp, Taxis vs Uber, Hotels vs Airbnb etc.